To detect alien civilizations, astronomers need to make some assumptions about the forms they might take — and the traces their technological artifacts could leave behind. An outrageous new paper by a mathematician at Kansas State University does just that, positing that a sufficiently advanced alien civilization would likely build starships powered by the radiation thrown off by small black holes — and speculating that astronomers could use gamma telescopes to spot evidence of these black hole starships. 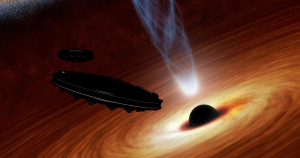 The basic idea, according to mathematician Louis Crane, is that a spaceship powered by a black hole would leave distinctive spillover from gamma rays. He suggests astronomers could detect that spillover using a telescope like the orbital Fermi Gamma-ray Space Telescope. He also speculated about what it would mean for a civilization to be capable of creating an artificial black hole — and it sounds absolutely epic. The post New SETI Plan: Detect Alien Starships Powered by Black Holes appeared first on Futurism. SpaceX isn’t the only company attempting to revolutionize the way we send astronauts to space. Boeing, the largest aerospace company in the world, is looking to send up its own take on a passenger spacecraft, which it calls the CST-100 Starliner, to the International Space Station. Boeing is planning to launch the capsule — uncrewed for now, as a test flight — on an Atlas 5 rocket as early as April, according to NASA. 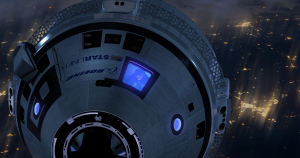 Boeing’s commercial spacecraft shares similarities with SpaceX’s Crew Dragon: it can seat a crew of seven, be operated from a central control panel, dock autonomously with the ISS, and can also be reused multiple times. Boeing’s Starliner is the result of a $4.2 billion contract signed with NASA in 2014 under the Commercial Crew Program. SpaceX signed a very similar contract for its Crew Dragon mission at the same time, although it paid SpaceX just $2.4 billion. SpaceX successfully launched its passenger spacecraft to the ISS on Saturday, becoming the first ever private American spacecraft to do so. It also marked the first time astronauts launched into space from American soil since the end of NASA’s Space Shuttle program in 2011. Boeing has tests to complete before it takes off. “There still are many critical steps to complete before launch and while we eagerly are anticipating these launches, we will step through our test flight preparations and readiness reviews,” Kathy Lueders, Commercial Crew Program manager at NASA said in an official update. SpaceX is planning a crewed test flight in July of this year. Boeing wants to do the same only a month later — and its first pilots are already on stand-by. The post Boeing Is Prepping to Launch Astronauts to Space Station appeared first on Futurism. Japanese tech giant SoftBank partnered with NASA and U.S. aerospace company AeroVironment to build a massive solar-powered drone that can beam 5G connectivity down to practically anywhere in the world. A maiden voyage of SoftBank’s Hawk 30 prototype could take place as soon as next week, according to a November Space Act Agreement with NASA. More test flights will follow within the next three months — an initiative that if successful could bring wireless connectivity to the most remote regions of the globe. The Hawk 30 is an unmanned aerial vehicle (UAV) that features ten electric engines and can fly at altitudes of over 65,600 feet (20 km) according to IEEE Spectrum. Other than that, details are sparse. The Hawk 30 won’t be the first UAV of its kind to attempt to bring connectivity to remote areas. The drone that holds the record of any winged horizontal aircraft was set by AeroVironment’s previous prototype, the Helios. That prototype was “an elegant flying wing wider than a 747 but weighing less than just one of the jumbo jet’s 18 landing wheels,” IEEE Spectrum writes. It flew at an altitude of 93,000 feet back in 2001, but splintered into tiny pieces and fell into the Pacific Ocean just two years later due to turbulence. 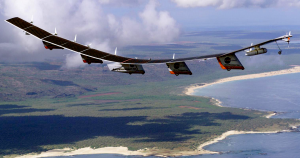 Facebook also jumped on the bandwagon with its Aquila solar-powered drone. The Aquila project was an experiment to see if it was possible to bring internet connectivity to remote areas as well. A prototype stayed aloft for almost two hours over the Arizona desert in June 2017 during its second test flight. But the project was grounded in June 2018. Even Google tried its hand, testing its SkyBender system in 2016. High-altitude balloons made more sense to the company in the end — the project was replaced by Alphabet’s Loon project in 2017. It’s a concept with a poor track record so far. But that’s not stopping companies from learning from their mistakes and trying again. The post NASA Is About to Test a Giant Solar Drone That Broadcasts 5G appeared first on Futurism. Two of NASA’s astronauts are scheduled to make history this month. On March 29, Anne McClain and Christina Koch will leave the relative safety of the International Space Station for a spacewalk to upgrade the craft’s batteries. Though rare, a spacewalk alone isn’t history-making. 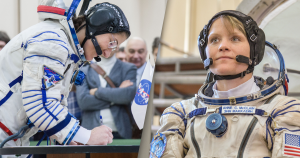 What’s exciting is the fact that this spacewalk will be the first to feature only women astronauts — an inspiring sign that women are catching up with men in exploring the final frontier. On Wednesday, NASA spokeswoman Stephanie Schierholz confirmed the all-female spacewalk with CNN. “As currently scheduled, the March 29 spacewalk will be the first with only women,” she told the network. In addition to McClain and Koch, Schierholz pointed out that two other women will play important roles behind the scenes for this spacewalk — Mary Lawrence and Jackie Kagey will serve as the spacewalk’s lead flight director and lead spacewalk flight controller, respectively. A third woman, Canadian Space Agency flight controller Kristen Facciol, will support the spacewalk from NASA’s Johnson Space Center in Houston. She’s the one who first broke the news of the all-female spacewalk with an exuberant tweet on March 1. Still, right now, it’s looking like McClain and Koch will spacewalk their way into the history books on March 29. The post NASA Announces World’s First All-Female Spacewalk appeared first on Futurism. A loophole designed to protect lives is actually endangering them. 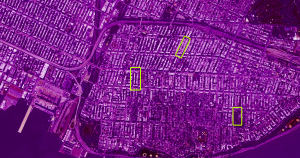 While cell phone companies typically require a court order before they’ll give law enforcement officials a customer’s real-time location data, they will make exceptions under “exigent circumstances” — for example, if turning over the data might prevent someone from being harmed. Now, Motherboard is reporting that phone companies are also turning over this data to people impersonating officials — another troubling example of how little tech companies are doing to protect your personal data. According to Motherboard’s sources — which included Valerie McGilvrey, a skip tracer hired to find people’s locations — Verizon, T-Mobile, and Sprint have all turned over real-time location data to scammers who claimed to be law enforcement officials. In some instances, the scammers were bounty hunters or debt collectors. In others, they were stalkers and domestic abusers trying to track down their victims. The stories they spin vary, but fake child kidnappings seem to be common approach. 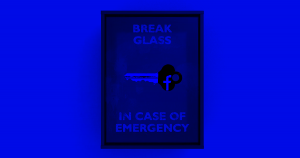 This is far from the first example of tech companies inadequately protecting user data — from Facebook to Google, we constantly hear about companies experiencing data breaches, with users’ personal data ending up in the hands of people who were never meant to have access to it. 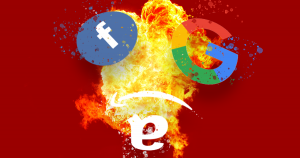 The issue has now gotten to the point that some legislators are suggesting bills to jail the execs of companies that don’t adequately protect user data — and if there’s one thing more worthy of punishment than accidentally leaking personal data, it might be willingly handing it over like these telephones companies are doing. The post Stalkers Are Pretending to be Cops to Steal Your Phone’s Location appeared first on Futurism. Mission Demo-1 is officially complete. After successfully undocking from the International Space Station in the early morning hours and burning through Earth’s atmosphere, SpaceX’s passenger spacecraft slowly descended back down to Earth, before safely splashing down into the Atlantic Ocean — and right on schedule at 8:45 am EST. 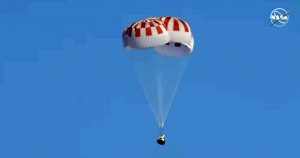 Crew Dragon’s descent was slowed thanks to four large parachutes it deployed once it re-entered Earth’s atmosphere. Astronauts loaded roughly 300 pounds (136 kg) of cargo from the ISS into the spacecraft on Thursday to send back down to Earth. SpaceX successfully launched the spacecraft on Saturday. It marks the first time a passenger spacecraft launched from American soil to the ISS — and returned safely back down to Earth — since the end of NASA’s Space Shuttle program in 2011. SpaceX’s Crew Dragon docked itself, with no robotic arm required, to an open port of the International Space Station early Sunday morning. It then spent five days docked to the station while astronauts checked out the inside of what could one day become their ride back home. A lot could’ve gone wrong. The cargo Dragon variant featured a different parachute system and had a differently shaped hull. “I see hypersonic re-entry as probably my greatest concern,” SpaceX CEO Elon Musk said during a post-launch press event on Saturday. In July, SpaceX is hoping to send the Crew Dragon capsule back into space — but this time with NASA astronauts Bob Behnken and Doug Hurley on board. The post SpaceX’s Crew Dragon Spacecraft Splashes Down in the Atlantic appeared first on Futurism. 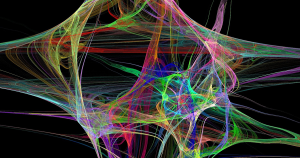 The benefits of taking psychedelics could last long after the trip ends. A team of Dutch researchers has found that psilocybin, the active ingredient in psychedelic mushrooms, doesn’t just increase a person’s creativity, empathy, and feeling of well-being while a user trips. It also allows them to experience all of those benefits for up to seven days — providing valuable insight into how we could tap into the therapeutic value of hallucinogenics. For their study, which was recently published in the Journal of Psychoactive Drugs, the team from Maastricht University recruited 55 attendees of a retreat of the Psychedelic Society in the Netherlands. They asked the subjects, about half of whom hadn’t taken psilocybin before, to complete a series of tests designed to measure their creativity, empathy, and general satisfaction with life three times: once the evening before ingesting a tea made from psychedelic mushrooms, once the morning after drinking it, and then finally seven days later. As Mason admitted to PsyPost, the study did have several limitations, including the lack of a control group and the fact that the participants were all people who chose to attend a psychedelic retreat. However, she still believes the team’s study produced valuable insights into the potential therapeutic benefits of psychedelics. The post Psychedelic Mushrooms Can Boost Creativity and Empathy for a Week appeared first on Futurism. Farmers in New Zealand have a new tool to herd sheep and cows, according to Radio New Zealand: drones outfitted with speakers that blast the sounds of dogs barking. “That’s the one thing I’ve noticed when you’re moving cows and calves that the old cows stand up to the dogs, but with the drones, they’ve never done that,” shepherd Corey Lambeth told the station. A Radio New Zealand video shows Lambeth corralling cows and sheep using a drone with a harsh digital bark. Lambeth’s employer, Ben Crossley, confirmed that his fourth-generation farm is indeed using drones to control sheep. One favored model: the DJI Mavic Enterprise, which is already outfitted to play sounds — such as barking — over a speaker. The Washington Post noted that farmers are already using drones around the world for a variety of farming tasks, *including* surveying crops. The Washington Post noted that farmers are already using drones around the world for a variety of farming tasks, including surveying crops. Having the devices deal directly with animals is less common — but it could be a vision of the future of agriculture. Dogs, which were already used for herding in New Zealand, are learning to work alongside the drones, according to another story by Radio New Zealand. 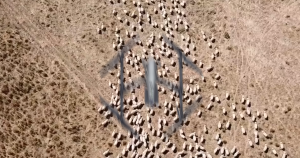 The post New Zealand Farmers Are Using Drones to Herd Sheep appeared first on Futurism. In the future, your car will charge your house. That’s according to Japanese carmaker Mitsubishi, which is working on a solar platform — including a sizable home battery, charger and solar panels — called Dendo Drive House. The twist: it can use the company’s lineup of plug-in hybrid cars to store extra power. It’s a futuristic concept: when the sun shines, both your car and home charge up at the same time thanks to a “bi-directional charger.” If you’re stuck with no power from the electric grid, your home is able to use up your plug-in hybrid car’s remaining battery reserves. 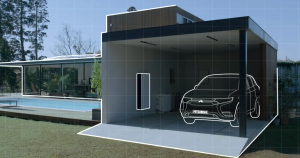 In its promotional video, Mitsubishi argues it might even save you some money — you can chose to charge your home from the grid at night, when electricity prices are lower. The reveal came alongside the announcement of Mitsubishi’s Engelberg Tourer, a “next-generation crossover SUV concept” at this year’s Geneva Motor Show. The Tourer is meant to skip the need for charging infrastructure altogether, according to the press release, thanks to its generous battery pack — and of course the Dendo Drive House platform with its bi-directional charging capability. It’s not the first time the idea has cropped up: Tesla CEO Elon Musk mentioned the idea in a July 2018 tweet, pointing out it might make sense for his electric vehicle company to “revisit” the idea. 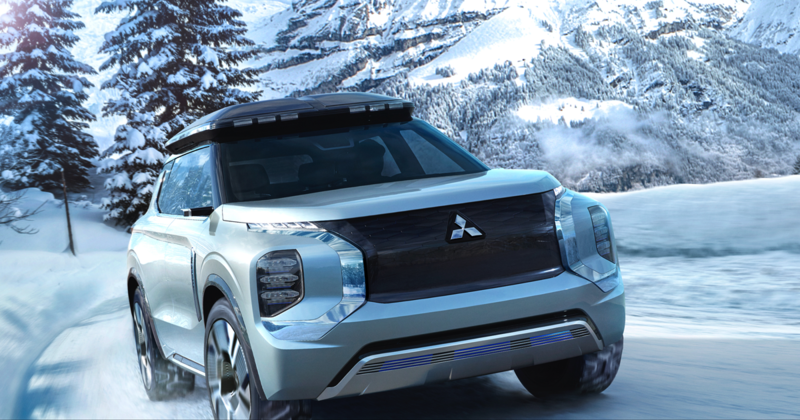 Like many concepts of its kind, there’s no guarantee Mitsubishi’s SUV and the Dendo Drive House platform will ever be released to the public. While Tesla has already shown the benefits of mounting a massive home battery packs to your garage wall, the efficiency of home solar panel technology still has a way to go. But who wouldn’t want to save some money on their energy bills while ensuring that their energy demands are met even during a power outage? The post Mitsubishi’s New Hybrid Can Power Your Home During a Blackout appeared first on Futurism. A key promise of the digital cash known as cryptocurrency is its security — because only you possess the password to access your money, it’s presumably more safe than it would be at a bank. 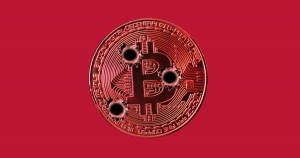 But a grisly crime in the Netherlands — in which home invaders tortured a crypto trader in an attempt to force him to give up his coins — shows that there’s also a dark side to having total control over your own wealth. According to the Dutch newspaper De Telegraaf, a trio of robbers disguised as police burst into the home of an unidentified cryptocurrency trader in late February. Then, in view of the man’s four-year-old daughter, they tortured the crypto trader with an electric drill — causing injuries so severe that he was hospitalized for five days, according to a follow-up story. It’s not clear whether they obtained any of the crypto trader’s funds before leaving, but if he did turn over his password, the criminals could have transferred the money to an anonymous account almost instantly. Dutch police were horrified by the crime, according to De Telegraaf, and dispatched 15 officers to investigate. The cops refused to comment, but police sources confirmed to the newspaper that the criminals were after the man’s cryptocurrency holdings. Crypto news site CoinTelegraph pointed out that there have been other examples of violent criminals attempting to steal cryptocurrency, such as a Russian businessman who was held hostage until he surrendered his Bitcoin funds. More on cryptocurrency: Did a Crypto CEO Fake His Own Death to Abscond With $190 Million? The post Robbers Tortured a Man With a Drill to Steal His Cryptocurrency appeared first on Futurism. First, pickup truck owners started taking over Supercharger stations in apparent protest. Now a vandal has struck one of Tesla’s electric vehicles chargers. 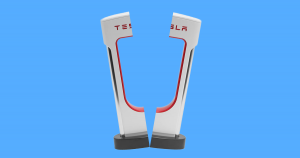 Last week, a 52 year-old man physically vandalized the charging cable and ports at all the docks of a local St. George, Utah’s Tesla Supercharger station, local news reports — the latest skirmish in a simmering culture war about electric vehicles. Doak later confessed to his crime. Whether it was his intention was to vandalize a Tesla Supercharger station in particular is unclear. Police estimate total repair costs to be $8,000. The news comes after pickup drivers in the U.S. were found to park their trucks in unoccupied Tesla Supercharger spots. The trend became known as “ICEing,” due to the symbolic weight of vehicles with internal combustion engines (ICE) blocking access to electric vehicle charging stations. Tesla developed a clever solution to the problem earlier this year by installing metal hurdles that could be lowered using a QR code on the Tesla owner’s phone. It’s an ominous trend, but incidents have thus far been uncommon. But it goes to show that not everybody is happy about the spread of electric cars — for whatever reason. The post Police Arrest Vandal Who Trashed Tesla Supercharger appeared first on Futurism. Typically, the last thing an automaker wants the media to present is graphic video of its vehicles crashing. Not so with Local Motors. The Arizona-based startup reached out to The Verge with exclusive video of its 3D-printed self-driving shuttle Olli in what CEO Jay Rogers calls its “worst-case scenario”: smashing into a wall at 40 kilometers per hour (25 miles per hour). The video of the crash test, which was recorded in late 2018, is quite spectacular, with plenty of flying glass and buckled wheels. Still, once the wreckage settles, it’s clear that the structure of the self-driving shuttle has remained largely intact. In another video shared with The Verge, Olli doesn’t appear to sustain any damage at all — though in that one, it’s only moving at 4.8 kph (3 mph). Local Motors is already testing Olli on public roads, where it operates at speeds that roughly split the difference of the two crash videos: 24 to 29 kph (15 to 18 mph). According to Rogers, the fact that the vehicle is 3D printed tends to be a point of concern for potential passengers. 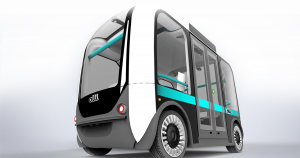 But it’s the 3D printing that allows Local Motors to easily tweak Olli’s design to improve safety or incorporate the latest technology, he said. The post Watch a 3D Printed Self-Driving Shuttle Smash Into a Wall appeared first on Futurism. 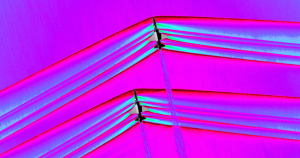 NASA engineers have captured the first images of the interaction between shockwaves from a pair of flying supersonic aircraft — and they are stunning. “We never dreamt that it would be this clear, this beautiful,” physical scientist J.T. Heineck added. When an object moves faster than the speed of sound, it causes rapid air pressure changes called shockwaves. To record the interaction between shockwaves from two craft, NASA had two T-38 jets from the U.S. Air Force Test Pilot School at Edwards Air Force Base fly at supersonic speeds, with one jet about 30 feet behind and 10 feet below the other. NASA then flew a B-200 King Air aircraft in a holding pattern at an altitude of approximately 30,000 feet. Using a special recording system, including a camera capable of recording 1,400 frames per second, the team then captured footage of the two T-38s as they passed about 2,000 feet below the B-200 at supersonic speeds. When shockwaves merge, they produce sonic booms, loud noises that are one of the reasons supersonic flight is currently restricted over land. NASA is developing a craft called the X-59 Quiet SuperSonic Technology X-plane that’s designed to fly at supersonic speeds without producing any sonic booms — just a quiet rumble. However, if NASA hopes to convince regulators to change existing restrictions on supersonic flight over land — and enable travelers to get from one part of the U.S. to the other far more quickly — they’ll need to be able to produce highly detailed, statistically sound images of the upcoming X-59 demonstrations. And now, the agency knows it has an imaging system capable of producing those photos. The post NASA’s Stunning Image: Supersonic Shockwaves Smashing Together appeared first on Futurism. What Happens Once Robots Become Film Directors? AI is advancing at exponential rates and taking on increasingly complex tasks. This film, “More Human Than Human”, shows viewers just how far AI has come. The post What Happens Once Robots Become Film Directors? appeared first on Futurism. Every day, Americans use an estimated 500 million plastic straws — and the vast majority are ending up in landfills or oceans, where they’ll likely remain for hundreds of years. More and more locations are starting to ban these straws, but rather than asking people to live a straw-less existence, a startup called Loliware thinks we should provide them with an environmentally friendly alternative — and that’s why they’re now proposing we sip our sodas through seaweed. Loliware has developed a straw that the company’s sustainability adviser, Daniela Saltzman, told Business Insider “looks, feels, and acts like plastic.” However, it’s actually created out of “hyper-compostable” seaweed that biodegrades much like a banana peel on land and breaks down in weeks in water. This summer the company will begin shipping its seaweed straws to several customers, including hospitality chain Marriott and beverage company Pernod Ricard. 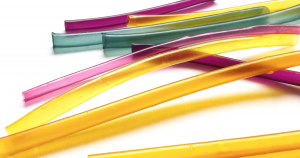 By the end of 2020, Loliware expects to be able to produce 30 billion straws in a variety of styles, according to a Fast Company story, and it’s aiming for a production cost about the same as paper straws. Loliware isn’t the first company to produce an alternative to plastic straws, but existing options leave much to be desired. Reusable stainless steel straws can be a pain to clean, bamboo ones can leave a woody taste in the drinker’s mouth, and glass straws are a bad idea for klutzes prone to dropping things. Paper straws are disposable, so that’s a benefit, but they can also become mushy quickly and cause whatever you’re drinking to taste like, well, paper. According to Loliware, its seaweed straws only start to turn soft after 18 hours of use. They also have a “neutral” taste, CEO Chelsea Briganti told Business Insider, and while the straws are edible, she doesn’t recommend eating them. More on plastic pollution: Stop Whining That Your Plastic Straws Are Disappearing. Be Glad They’re Not Ending up in Oceans. The post Seaweed Straw “Looks, Feels, and Acts Like Plastic,” Says Startup appeared first on Futurism. A Business Insider investigation into Facebook’s security practices provides a riveting look at how the company protects its celebrity executives — but the strangest revelations were about the company’s extraordinary efforts to keep CEO Mark Zuckerberg safe. One persistent rumor exemplifies the company’s apparent paranoia: Workers at the social media giant claim that the company’s security staff installed a secret “panic chute” at the company’s headquarters that Zuckerberg’s security detail can use to evacuate him in the case of an emergency. Facebook’s executive-protection team is run by a former U.S. Secret Service special agent named Jill Leavens Jones, according to BI, and she has serious resources to protect Zuckerberg, Facebook COO Sheryl Sandberg, and others — including a $10 million annual budget dedicated solely to protecting the CEO and his family. That funding has led to some futuristic security features, according to BI‘s investigation. In addition to the rumored panic chute, Zuckerberg himself has access to a room with bullet-resistant windows and a “panic button.” Nobody is allowed to park in the spot in the parking garage directly below his desk for fear of car bombs. The strangest takeaway from the story, though, isn’t what Facebook does to protect Zuckerberg from stalkers and potential threats — it’s the company’s efforts to protect him from Facebook employees themselves, who aren’t even allowed to take photos of the enigmatic CEO. The post Zuckerberg Said to Have “Panic Chute” for Escape From Facebook HQ appeared first on Futurism. 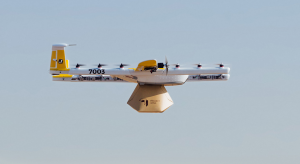 Google parent company Alphabet is gearing up to launch what the Australian Broadcasting Corporation reports will be the world’s first commercial drone delivery service, which will fall under its Project Wing arm. But Alphabet may be in for a fight before the delivery program takes flight in Australia by this coming June, according to the ABC — because local residents are furious about the idea of buzzing drones invading their community. Alphabet says its drones will be able to deliver coffee, food and medication — but residents of Canberra, where the program will take place, are worried about what it’ll be like living among the drones. “Things fall out of the sky, it’s quite hard to get drones to work properly, it’s quite hard to deal with drones when they lose communications… we should be treating it that way and applying the precautionary principle and getting out ahead of the problem,” said Roger Clarke, a professor at Australian National University. For its part, Alphabet recently tested a quieter version of its delivery drone. “We’re trying to be as transparent and as open as we can,” Project Wing CEO James Burgess told the Canberra Times. But not all residents are convinced. 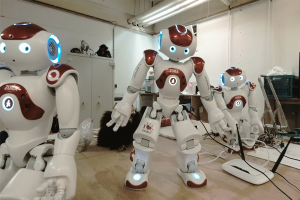 “That is what is going to happen with some forms of these new robotics technologies unless corporations deal the public in, and get the downsides understood and prevented or mitigated, and they’re not doing it,” Clarke said. The post Residents Are Furious About Google’s Drone Delivery Service appeared first on Futurism. AI arms control is all “fun and games” until someone accidentally recreates Skynet. It isn’t the first time Kissinger, a controversial figure in American foreign policy, has warned of the potential dangers of AI technology. In an op-ed for The Atlantic Kissinger opined that the U.S. government should “consider a presidential commission of eminent thinkers to help develop a national vision” on AI. He’s not alone in that consideration. Still, despite concerns, nations continue to develop tanks, planes, and bipedal androids. Just last month, President Donald Trump issued an order encouraging the United States to “prioritize AI”, lest the US fall behind other nations in AI development. While AI still has more jovial applications which are being explored, like generating cat pictures and creating works of fine art, autonomy continues to creep into weapon systems development causing a backlash from the employees of companies like Google and Microsoft. The uncertain future and unbound potential of AI may require more reflection from humanity before we act on AI. 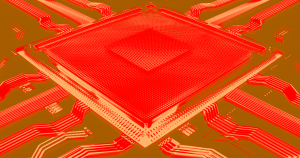 The post Controlling AI Weapons May Be Impossible, Warns Former US Secretary of State appeared first on Futurism. In November, the news website Quartz unveiled a bold idea: a studio, funded by the Knight Foundation, dedicated to reporting the news using machine learning techniques. Today, the Quartz AI Studio’s first story dropped — and it’s an intriguing peek at how advancements in artificial intelligence could provide journalists with new tools for digging into public documents. For the story, Quartz reporters trained an algorithm to examine the section of ride-hailing app Lyft’s Initial Public Offering (IPO) that lists risks the company anticipates — and to identify the most “distinctive,” or unusual, things that rattle Lyft’s executives. The resulting list of Lyft’s unusual concerns range from the fairly obvious to the moderately surprising. In addition to having concerns about “public perception,” the company’s leaders are also worried about how healthcare privacy laws will affect customers who use its service to catch rides to medical appointments. They’re also sweating whether cyberattacks could affect Amazon Web Services, which runs its platform. Quartz’s Lyft story isn’t the most groundbreaking work of journalism in the world, but it’s an interesting proof of concept about how reporters can leverage new tools to pull interesting takeaways from otherwise dry public records — and, perhaps, a preview of things to come. “This is taking [data journalism] to the next level where we’re trying to get journalists comfortable using computers to do some of this pattern matching, sorting, grouping, anomaly detection — really working with especially large data sets,” John Keefe, Quartz’s technical architect for bots and machine learning, told Digiday back when the Quartz AI Studio first launched. 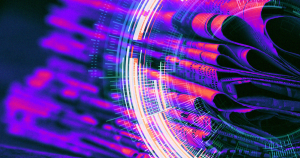 The post Journalists Reported a News Story Using Machine Learning appeared first on Futurism.